Tired. Have you ever had one of those days where you just don’t feel like doing anything? I had a whole week of them. I ended up taking most of the week off which may not have helped me physically but it will definitely help me mentally. So TL;DR there isn’t a whole lot going on in this week’s recap. 4 slow miles on the treadmill. No, it wasn’t rainy.. or dark.. or windy. I just didn’t feel like getting out there but at least I got a few miles in followed by my leg circuit. SORE. I have no idea what hit me.. my workout on Monday was mediocre at best. Tired and still sore? I really didn’t think I pushed it hard enough to be this sore but I was fine with taking another day of rest. What’s the point now? This was honestly just laziness. Continuing the laziness trend at this point. I FINALLY RAN. Lol.. I actually woke up and still wasn’t mentally ready to run.. even after four days of rest. It was rainy and windy so I wanted to stay in bed but Christine made me commit to run an easy 7 miles with her before our races on Sunday. And it felt great to be outside! It wasn’t my planned 14 miles but my ankle was hurting a bit anyway. Race day – San Jose 408k! I didn’t have a lot of pressure on myself for this race but I’ll save the details for my race recap. It hopefully comes as no surprise that having a stronger core can help you to become a stronger runner. And how does one get a stronger core? You guessed right… ab exercises! Is it time to start adding some ab exercises in after your runs? Or maybe it’s time to change up your current ab exercise routine. Here are a few of my favorite exercises to do after my runs. Start face down with your forearms on the ground and your legs extended behind you. Align your elbows under your shoulders. Though many people prefer to clasp their hands, it is recommended to try palms up or palms down. That way, you are focused on engaging your core and avoid putting additional stress on your hands. Ready? Engage your abs, tuck your toes and lift your body off the ground. Check to see if you form a straight line. If you notice that your hips are a little high, you may need to drop your hips and engage your core even more. How long can you hold this for? Side Plank Variation – Yup, you guessed it. Choose a side to face, stack one leg on top of the other and balance on one forearm. If you’re having trouble balancing to begin, start by practicing with your knees stacked on the ground. Lie on your back (face up) on the floor. Your knees should be bent (90 degrees) and your feet should be flat on the floor. Your arms will stay at your side, palms down. Now lift your hips and back off the floor until everything forms a straight line down to your knees. Make sure you squeeze your glutes to keep a strong back. Hold for 10 seconds then lower slowly to the floor, repeat 10 times. Single Leg Variation – Same instructions but one leg will be lifted. Remember to keep your quads even and your hips straight. Twist Variation – Instead of holding for 10 seconds when you get into the bridge, you will slowly dip one hip (keeping the other hip in place), then raise it slowly back up. Then slowly dip the other hip (keeping the first hip in place). Repeat, 10 times on each side. Remember to keep your glutes and abs engaged. Get ready. Lie on your back (face up again) and place your hands behind your head for support. Now extend your legs into the air. The motion will be similar to pedaling a bicycle, hence the name. Rotate to the left, your right elbow will meet your left knee while your other leg extends. Keeping your feet off the ground, now switch sides, continuing to alternate or pedal your imaginary bike. How long can you keep this up for? For starters, try to aim to reach one minute. Of course, these are only to name a few. It is important to switch up exercises and continuously challenge your body in new ways. What are some of your favorite ab exercises? So you want to start running but you don’t know where to start when it comes to running shoes? I’ll give you a tip, do not purchase the cheapest pair that you can find online. Now I tend to be overly cautious when it comes to injuries and my feet but ask any runner and they will tell you that your running shoes can either make or break you, literally. If you have never been fitted for running shoes, I highly recommend visiting your local running store. Most running stores will be able to evaluate your foot type, biomechanics and run a gait analysis. That will help to narrow down the models across different brands that are best for your feet. For example, I wear custom orthotics from my podiatrist so I know that I need to wear a neutral shoe. It may not seem important but this will help to keep you injury-free. Size up by at least half size and don’t be ashamed if you need to go even bigger. I started out by sizing up at a half size but feet change over time and I now size up a full size larger than my everyday shoes. While it may be tempting to run in the same pair of shoes until they are completely worn out, try to resist the urge to take care of your feet. The general rule of thumb is to replace your shoes every 300 to 500 miles, depending on the individual. As I mentioned before, I am overly cautious and I replace my shoes every 250 to 300 miles. I am generally able to tell when my shoes are getting close to the end because either my shoes feel weak or my feet start to hurt. As with everything else in running, the most important takeaway is to go by feel. Pay attention to how everything is feeling, your feet will thank you for it! If you are interested in learning more, Runner’s World posted a Running Shoe FAQ page that I highly recommend checking out! Many of my friends have asked me for advice in training for their first half marathon and I could not be happier and more excited to share my thoughts! The first question to ask – do you have a goal race? If so, when is it? How much are you currently running? It is so important to make sure that you give yourself enough time to train and prepare for your first race. This will ensure that you are prepared and confident when you get to the start line. Take a look at these training plans from Hal Higdon for some help! Planning your race and training schedule can sometimes be overwhelming, but it helps to make it fun! I look at my training log almost daily and write down notes about my run to keep me motivated. Practice proper nutrition and hydration, you will need it to run 13.1 miles. Visit your local running store and make sure you are wearing good shoes for running. This is one that many first time runners overlook because any exercise shoe can be used for running, right? Wrong. Listen to your body to avoid running through pain and thus potentially injuring yourself further. Don’t worry about time! If you have a goal time then that is fantastic, otherwise I would not suggest stressing out over your first race. There will be times that you may feel like quitting but remember why you started. Running is a mental sport and can be different for everyone. Test out different training methods and see what works best for you! Overall rule: trust the process and have fun! What are some of your best half marathon training tips? Stay tuned for race day tips! Running in the Dark – Crazy or Stupid? Every morning my alarm goes off at 4:45 am and I know that it is time to go for a run – after all, it wouldn’t feel right if I didn’t get my morning run in! I never used to worry about my early morning runs because I would rarely see anyone else or any cars on the road. Then I joined a running group and heard horror stories about running in the dark without a reflective vest so naturally, I bought one to fit in with all of the other runners. Now flash forward a year to yesterday morning when that running vest saved me from getting hit by a speeding Uber driver. Ok.. maybe that was a bit dramatic considering I also heard and saw the car coming so I easily moved out of the way. However, it did make me feel better to be wearing a reflective vest because I know for a fact that he saw me. Be aware – I admit, I’m almost too aware. I always get startled by my shadow or sounds from nearby bushes. Better safe than sorry! Ditch the tunes – To my point above, I wouldn’t be able to be aware if I was distracted. I love listening to music and podcasts during my runs but I save it for when the sun is out. Lights, lights, lights! – In addition to being seen, I would also advise to run where there is at least SOME light for you to see, even if you have a flashlight. For me, it’s not worth falling and getting injured because I couldn’t see something on the ground. 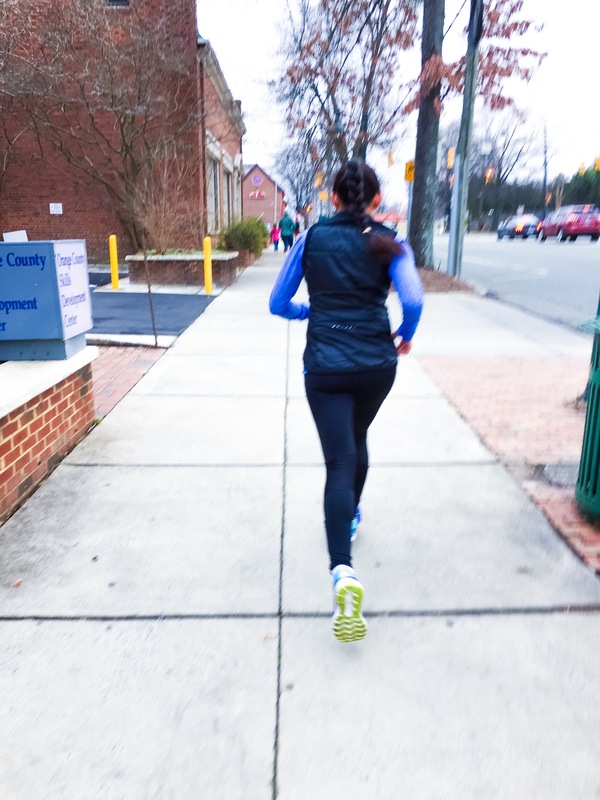 I love hearing tips and stories from fellow runners, feel free to share! My ITBS and plantar fasciitis injuries have been feeling pretty healthy so it’s time to start training for the Big Sur International Marathon!!!! The race is April 30, 2017 so I’m giving myself plenty of time to make sure that I’m healthy and ready. I will be posting my weekly recaps on my Sunday rest days so here goes the first of many..
Monday – rest, giving my injuries a little more time. Wednesday – 3.3 miles, easier and still no pain! Saturday – 8 miles, long run in 29 degree weather.. surprised myself with an 8:56 /mi pace. Then we ran an additional 2 miles with Fleet Feet Carrboro/Durham! Happy running, friends!!! Stay tuned for more updates.